The headline is pretty self explanatory really. But here it is – and what a thing of beauty it is! 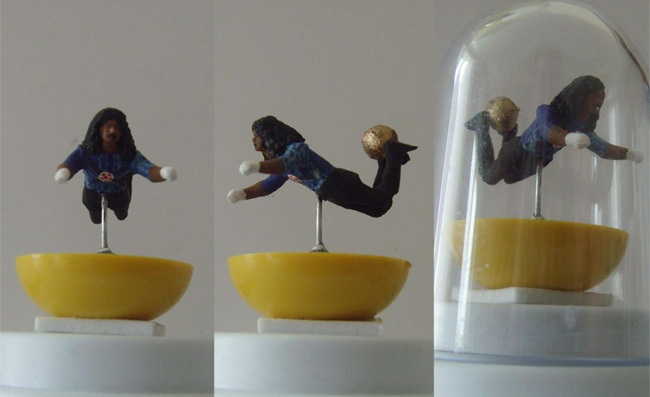 It’s quite an interesting idea, creating individualised Subbuteo figures for specific players. Maybe we could have a punching Joey Barton figure, a sexually aroused John Terry, Andy Reid with a pie in his hand, Abou Diaby in a crumpled heap on the floor and Luis Suarez performing a Nazi salute? Cantona doing a flying kick and Vinnie Jones grabbing balls would be great additions. John Terry, a wrap of coke in one hand, someone else’s missis in the other, aiming a kick at a pregnant woman. MGJ is right. A Vinnie Jones/Gaza double would be the absolute best!